In case you do not find the answer you were looking for, please fill in the contact form. Shuts down the computer after 30 seconds. Instruct computer to shutdown in half an hour (remote). Download WOSB from the developers website. Copy the wosb.exe in the same directory as Shutdow7.exe. Start Shutdown7 and open the settings. Activate the integration by checking the appropriate checkbox..
Click 'OK' and restart the program.. 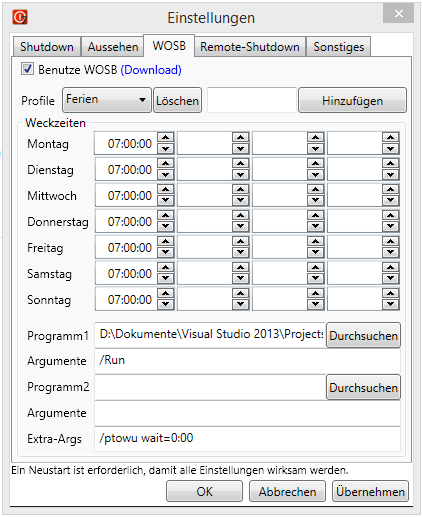 In the new created WOSB.xml you can specify the wakeup times Shutdown7 should use when the command Wakeup (Ini) is executed. Up to four times per day can be scheduled. Moreover, you can specify custom parameters, e.g. launching a program upon wakeup. Open the settings and activate the checkbox next to 'Server' in the section 'Remote-Shutdown'. Enter the port number you want to choose. The port has to be free. A port in the area of 5000-6000 is recommended. Type in your password. Your PC can only be controlled with that password. The password will be encrpted with the MD5-algorithm. If you have a router you have to forward the port to your computer. 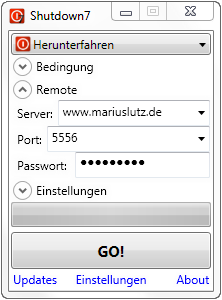 Go to the router webinterface (usually 192.168.0.1 or 192.168.2.1) and setup port forwarding. For further instructions refer to the router manual. Test the connection with Shutdown7 (see below). If you are using a software-firewall (Windows ships with one), you have to add an exception. Shutdown7 can add itself to the list of exceptions (Windows firewall only). Open the settings. Click on 'Firewall exception'. The exception is added automatically. 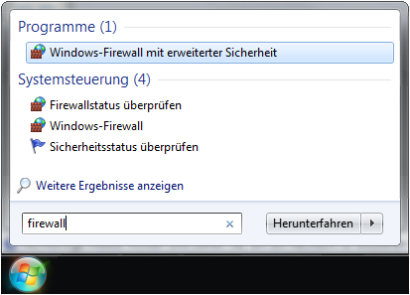 Geben Sie im Startmenü-Suchfeld 'Firewall' ein. Click on 'Windows-firewall with extended security'. Click on the right on 'new rule'. 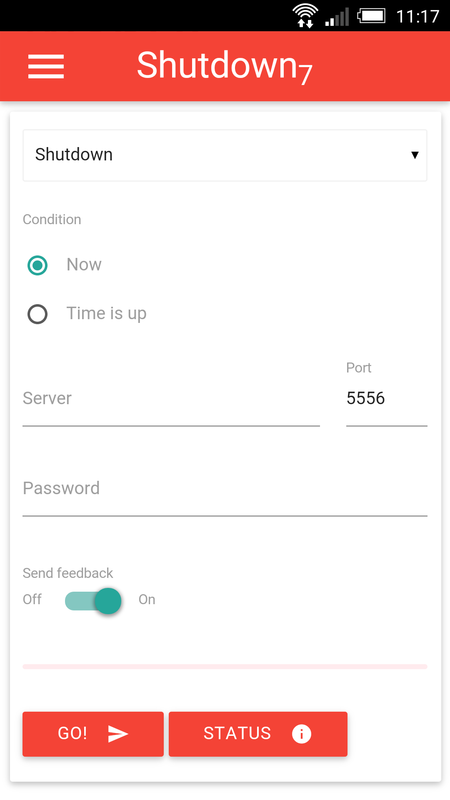 Click on 'Port' and 'Next'. 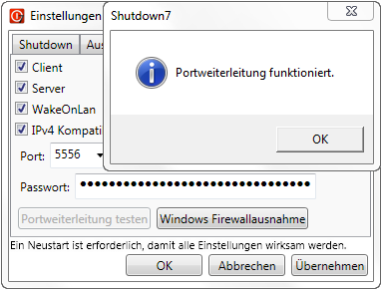 Type in the port number you are using in Shutdown7. Then click 'Next'. Type as name 'Shutdown7' and finish the assistant. 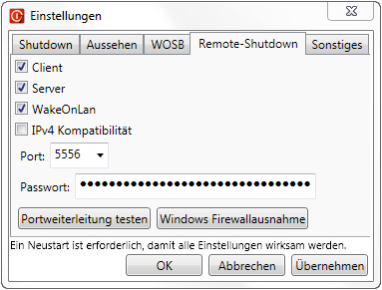 Close the window and test the connection with Shutdown7 (see below). Open the settings and open the section 'Remote-Shutdown'. Click on 'Test port-forwarding'. Shutdown7 tells you whether your computer is accessible form the internet. Usually your IP address changes every day. But you need a static IP-Adress to be able to connect to your server. You can get a static IP address by registering a subdomain by a service like www.dyndns.org or www.no-ip.org. To keep your IP address up to date you have to install a software which links your current IP address with the subdomain. Open the settings and activate the checkbox next to 'Client' in the section 'Remote-Shutdown'. Press 'OK' and restart the program. Open the remote section in the main window. Type in server-url (without http:// prefix), port and password. Press the start button. Allow the firewall prompts. Visit www.shutdown7.com/webui.php in your browser. Submit the request. The WebUI displays whether the action was successful.